A white blood cell attacking some bacteria. Scanning microscope photo: Jan Löfberg and Håkan Gnarpe. In Systema Naturae Linnaeus described the plants and animals, but there is a group of organisms he knew very little about: the bacteria. They constitute a realm of their own among all living things today. The Dutchman Leeuwenhoek invented a primitive microscope in 1680. Under this he could study bacteria and other microorganisms. He thought they had developed directly from clay and mud, a phenomenon called abiogenesis (spontaneous generation). In Linnaeus’ time the phenomenon abiogenesis was much debated. Linnaeus objected to all such talk. ”Anyone who believes that must have a mushroom for brains”. ”All life comes from the egg” Linnaeus said, and by that he meant that all life must be born from other life. Even though the origin of bacteria was discussed, no one thought of their function. It was not until the 19th century that it was discovered that bacteria cause disease. Later it was discovered that bacteria could be useful to humanity. The bacteria are the most primitive life forms we know of. They are smaller than all other organisms. 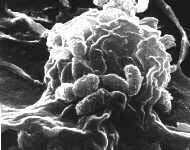 In the beginning there was no other life on earth than the bacteria. It is believed that plants, animals and fungi originated from the bacteria. There are only 2500 species of bacteria known, but they are the most common organisms. In a gram of soil 2.5 billions of bacteria can be found.